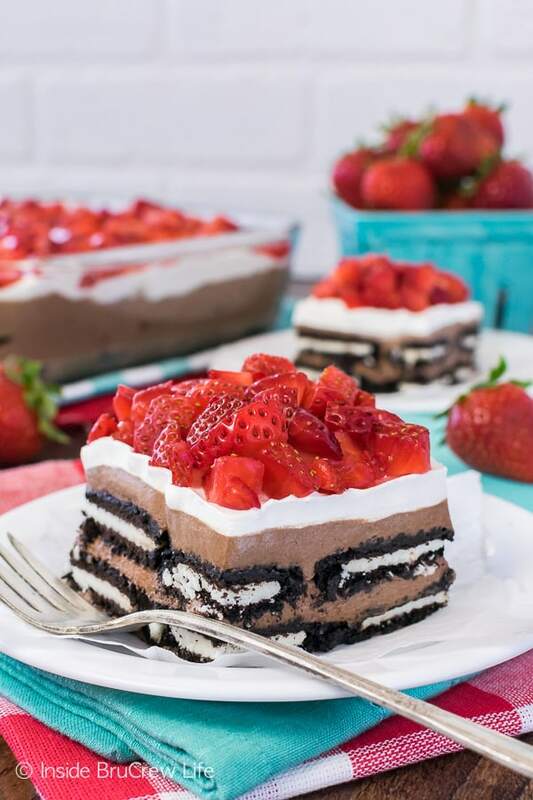 Layers of cookies, chocolate cheesecake, and strawberries make this easy No Bake Nutella Oreo Icebox Cake the perfect summer dessert. Chocolate and no bake always get my attention! Up until this past week, we have had hot days and cool nights. That cooler weather was perfect for having a campfire in the back yard at night and for working out in the early morning. Then this week hit and we have had more humidity during the day than usual. The hotter days have been carrying over into the evening. That doesn’t stop us from lighting up some of the wood in our backyard though. S’mores are a must have during the summer. Who am I kidding? I could do s’mores all year long. Give me that gooey chocolate and marshmallow any day! 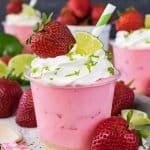 Another thing that is a must during the summer are no bake desserts. Even though we keep our air conditioning running all summer long, I still like to make easy desserts when it is hot outside. Why heat up the house and make the air work harder, right? I feel like I’m on a roll right now with no bake chocolate desserts. 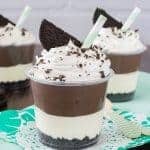 First I made this no bake chocolate cream pie and then these no bake mint mocha cheesecake parfaits. Does it surprise you that another no bake dessert loaded with chocolate is staring at you right now? Last week I remade this salted caramel Oreo icebox cake because I decided to video the recipe for Facebook. Our oldest couldn’t stop eating bite after bite of the dessert when I was finished with it. Lucky for my shorts and swim suit I resisted the urge to dive in too. 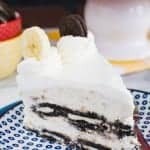 But it did get my brain thinking about other flavor combos that I could make another icebox cake in. 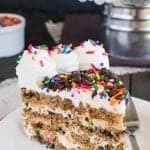 There is just something so delicious about cookies and no bake cheesecake layered in a pan. Plus, we had family coming to visit us for a couple days, so I had to have dessert ready for them. There might be a mutiny if I didn’t have something to share with them. Lucky for them and me, I was prepared with lots of cake! I had two pans in the fridge because we did the video and pics before they got to our house. Our nieces went crazy for this easy dessert. The oldest was raving on and on about how perfect the cookies, chocolate, and strawberries went together. She was so cute as she was describing it to me. 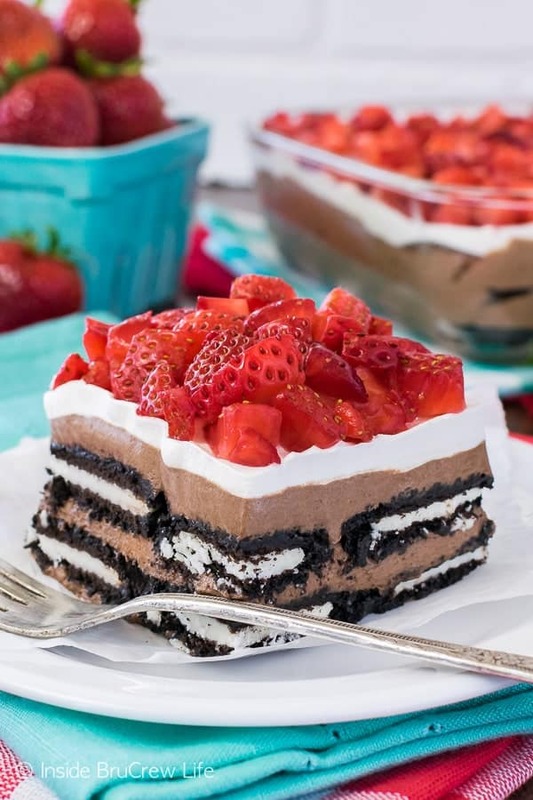 I’d like to take a minute to rave about how stinking easy this no bake Nutella Oreo icebox cake is to make. You can seriously have one in your fridge in about 15 minutes. You are only five ingredients away from dessert perfection. Ok, six when you count the berries on top, but those could totally be optional. All you have to do is beat together some no bake cheesecake, and then layer it with milk soaked cookies. How hard is that? Of course, then you have to refrigerate it for a few hours so the cookies soften up a little more. It isn’t totally necessary, but it does make it a lot easier to cut the cake into nice square pieces. If you don’t care about that, just grab a spoon and dive on it. 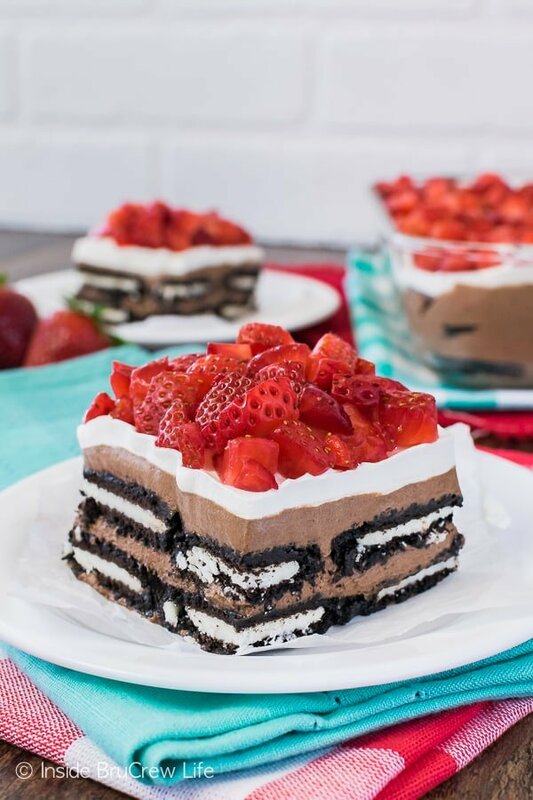 Layers of cookies, chocolate cheesecake, and strawberries make this easy No Bake Nutella Oreo Icebox Cake the perfect summer dessert for any picnic or dinner party! Beat the cream cheese, Nutella, and cocoa powder until creamy. Add 2 cups of Cool Whip and beat until completely mixed in. Spread 2 Tablespoons of the chocolate mixture on the bottom of an 8x8 pan. Dip one cookie at a time in the milk. Layer 16 cookies in the bottom of the pan. Spread 1/2 of the chocolate cheesecake on top. Repeat the layers. Cover the top with the remaining Cool Whip. Chill for 3-5 hours. 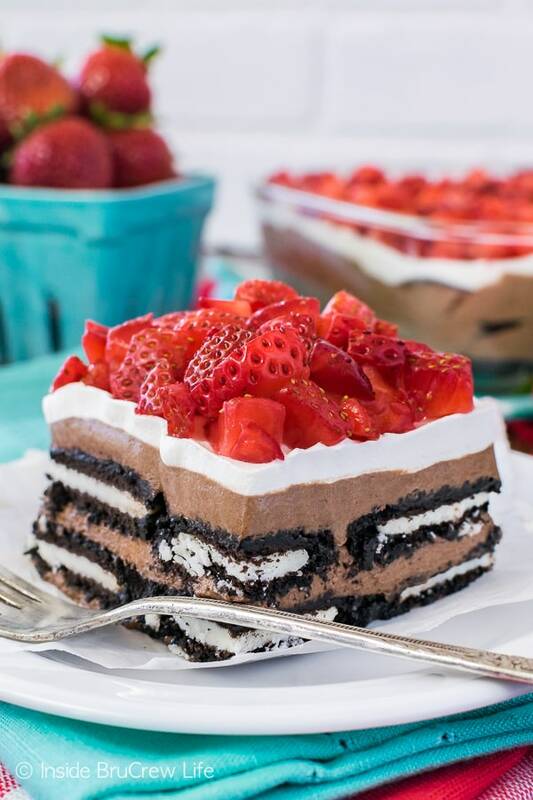 Cut into 16 slices and serve with strawberries. 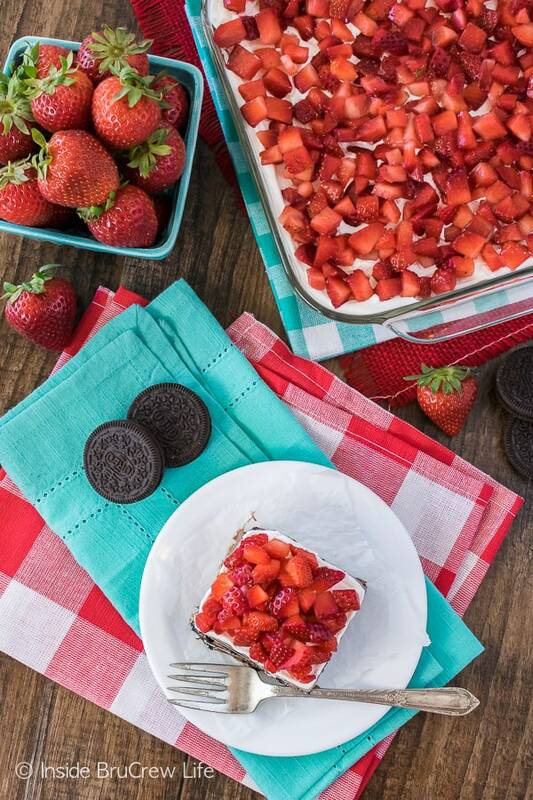 Still need some more no bake dessert ideas for this summer? You should check out this No Bake Pineapple Lush Dessert from Amy. 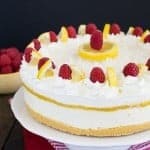 I’m a sucker for tropical desserts for sure! 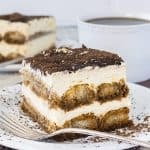 And of course with all the bananas we go through, I know my family would love this No Bake Banana Dream Dessert from Dorothy. Of course, first up on my list are these No Bake Brownie Bites from Chelsea. Brownies in minutes has me intrigued! Do you any suggestions if I wanted to replace the Cool Whip with real whipped cream?